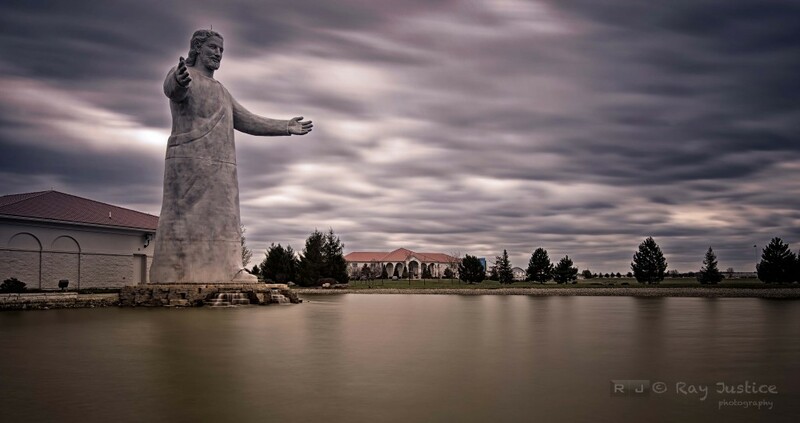 I recently traveled to Dayton, Ohio with my wife, Kandi, work related for her, possible photo opportunity for me, and I spotted the enormous outstretched arms of Jesus. I had not processed any of the images but after the Boston Marathon attack, my mind was instantly taken back to this image. Psalms 136:12 tells us “with a mighty hand and outstretched arm; His love endures forever.” No group or no one can ever take away the love our savior has for us. And as Jeremiah responds to God in Jeremiah 32:17 “Ah, Sovereign Lord, you have made the heavens and the earth by your great power and outstretched arm. Nothing is too hard for you.” By putting our faith in Jesus, he also makes nothing too hard for us. Those outstretched arms are always open for anyone to fill. I met a fellow photographer, C. Thomas Anderson, on this trip and look forward to sharing tips and shooting with him in the near future. This image was shot with my Nikon D4, 16-35mm lens, RRS TVC-33L tripod, and my Lee Big Stopper 10 stop ND filter.